Matthew Daddario is an American actor and TV personality best recognized for the TV show Shadowhunters. The actor’s filmography is probably low when compared to some old buddies in the industry – with less than 50 films to his credit, but not too poor for a guy who started churning out films barely six years ago and whose tiny list of movies include some of the blockbusters in the last few years. With impeccable acting, just like his actress sister, Alexandra Anna Daddario (popular for her role in Percy Jackson film series), Matthew has established himself in the industry. The actor is making pretty good use of the fame to appear in more top movies and is surely a star to watch. Mattew Daddario was born to a New York-based family headed by Christina and Richard Daddario. Both Christina, a lawyer and Richard, a prosecutor were overwhelmed by joy on his birth since he came after their first daughter. Years after his birth, the family also welcomed another baby girl Cathrine. All three siblings grew up in New York where Mattew Daddario was born. Richard used to serve as the head of the NYPD counterterrorism behind Mayor Michael Bloomberg. 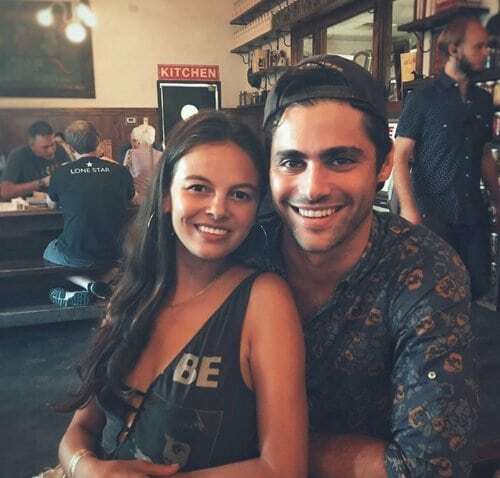 Richard’s father – that is Mattew Daddario’s grandfather Emilio Q. Daddario, also served as a top official in Democratic Party of the United States of America. He represented the U.S House of Representatives for state Connecticut from 1959 to 1971. The actor’s two sisters include one older, model and actress Alexandra Daddario and one younger, Cathrine Daddario. Daddario’s nationality is American and his ethnicity is White. The American star is of mixed origin including Irish, English, Italian, and Hungarian. Daddario had his high school education in Collegiate School, one of the oldest boys schools in New York. He continued at Indiana University Bloomington, graduating with a business degree in 2010. After graduation, it seemed Matthew Daddario took some time to find his standing, career-wise. With two years gone and drawing inspiration from his sister, he then warmly embraced acting. His first chance to use his talents came in 2012 with a role in the Drake Doremus drama film Breath In. The same year, Daddario joined Kens Scott on the comedy-drama film Delivery Man which saw the prolific director concentrate on the life of a deliveryman who is being chased by some thugs for the debt of $ 80,000. The movie was released in 2013 and the character “Channing” played by Daddario although not that major came out quite impressive. The next year, Daddario went for a role in the sports drama film When The Game Stands Tall, a role that seemed to suit his individuality best. In 2015, he gained worldwide importance after he was listed among the cast of the supernatural series Shadowhunters and was to portray Alec Lightwood. The acclaimed series gives life to Cassandra Clare’s series novels; Mortal Instruments and it started airing in 2016. It is currently running its third season and has so far, overshadowed other series. Since his breakthrough, Matthew Daddario has stayed busy as more and more directors are taking the opportunity to include him in their works. Travis Z is among such directors with a role on the remake of the horror film Cabin Fever written by well-respected producer, actor, and writer Eli Roth. He has also appeared in the 2016 short film The Last Hunt. The actor’s efforts have gone beyond earning him movie roles, they have also been highlighted with awards and nominations. He was awarded the Breakout Star in the 2016 teenage choice award by Choice TV for his role in Shadowhunters. He was also nominated for the same role in the MTV Fandom award in the category of “Ship of the year”. Other nominations include Teen Choice TV: Sci-Fi/Fantasy Actor, Choice TV: Ship and Choice TV: Liplock. Is Matthew Daddario Gay or Does He Have A Girlfriend? With roles that mirror Matthew Daddario as gay in the two groundbreaking films Delivery Man and Shadowhunters where he portrayed Channing and Alec Lightwood respectively, it is only natural for fans to assume that his sexual orientation is something far from straight. And to think that he always handles gay roles perfectly, it makes room for such assumption. Well, what do we expect from a guy that is so gifted? Consequently, many have been trying to get answers on whether or not he is gay and as such, questions about Daddario’s sexuality always pop up. But fans will have to live with the fact that in reality, the actor is into women. The 6 feet 3 inches tall star is absolutely not gay. A further proof to support this truth is the fact that the actor has been in relationships with different beautiful women including co-stars. Most recently, he has been spotted with Esther Kim, a Russian. The relationship seems to be enjoying some magical bond as they have allegedly been dating since 2013. The two lovebirds have also been showering each other with love on their different social media accounts.